Virabhadra Prabhu appeared as the son of Nityananda Prabhu. Scriptures say Virabhadra Prabhu is an incarnation of Vishnu and not an ordinary living entity. Yet He presented Himself as Krishna's devotee, and not as the Supreme Being. 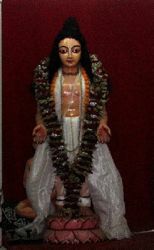 The photo of the Deity of Virabhadra Prabhu at His birthplace, Khardaha, India, courtesy of iskcondesiretree.net.